It’s the most wonderful (if most expensive) time of the year. 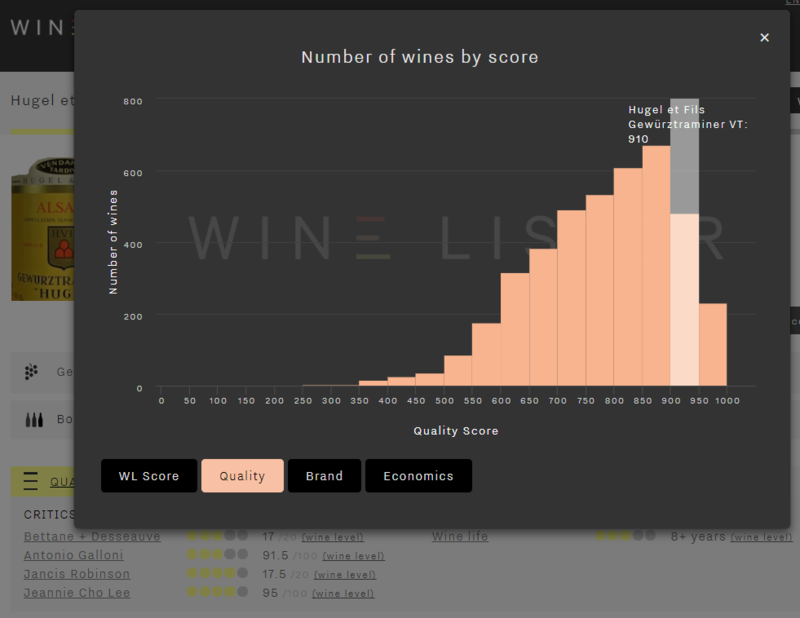 Wine Lister Value Picks help you to avoid compromise on your seasonal drinking choices, identifying wines and vintages with the best quality-to-price ratios. This week’s top five looks at some affordable options for you – still with impressive Quality scores – complete with two Ports in the mix to keep us feeling festive. With Italy and Portugal sharing the top five (and even the top 10) red Value Picks by Quality score, Wine Lister’s Christmas drinking picks stick firmly to Mediterranean climes. In first place is Castello dei Rampolla Sammarco 2010. Although it is this week’s most expensive option (at £75 per bottle in-bond* vs. an average £49 of the four other wines of this top five) the spectacular Quality score of 998 is impossible to ignore. 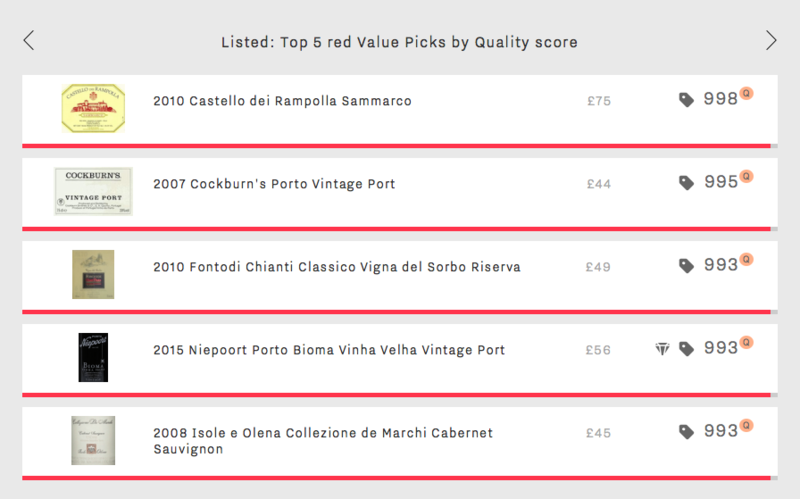 Indeed, it earns the highest Quality score of any 2010 red on Wine Lister, alongside three others – Castello dei Rampolla’s Alceo, Cerbaiona Brunello di Montalcino, and Vietti Barolo Ravera – all of which are at least £71 more expensive. Sammarco 2010’s remarkable Quality score is due a perfect score of 100/100 from Vinous’ Antonio Galloni, who describes it as “stunning” and “magnificent”. Next is this week’s first port – Cockburn’s Vintage Port 2007. With a Quality score of 995 and price of £44 there can be no doubt about its status as a Value Pick. It has just entered its drinking window, and with a predicted wine life of 53 years, it could make for the perfect Christmas gift (if you can refrain from drinking it yourself). The group’s second port, Niepoort Bioma Vinha Velha Vintage Port 2015, shares a Quality score of 993 with the last three spots of this week’s top five. It is the only one of this week’s Value Picks also to achieve Hidden Gem status – Wine Lister’s Indicator for excellent wines that are yet to receive proper recognition. Although it will not be ready to drink until 2028, at £56 per bottle this is an exceptional value wine to store away for Christmases to come. Rounding out this week’s top five in Tuscan triumph are Fontodi’s Chianti Classico Vigna del Sorbo 2010 and Isole e Olena’s Collezione de Marchi Cabernet Sauvignon 2008. They have both just entered their drinking windows, but will last for many years to come. Each earning a Quality score of 993, their modest prices of £49 and £44 per bottle respectively provide fantastic value. All that remains is to wish you a very Merry Christmas. *Prices shown assume the purchase of a whole case. See more on pricing on our website. With just over eight weeks to go until Christmas, part of the pre-season ritual of any respectable wine lover is surely agonising over which wines to drink with the holiday meal. Whether that means digging into the cellar or making new purchases, perhaps this week’s top five can provide some inspiration. 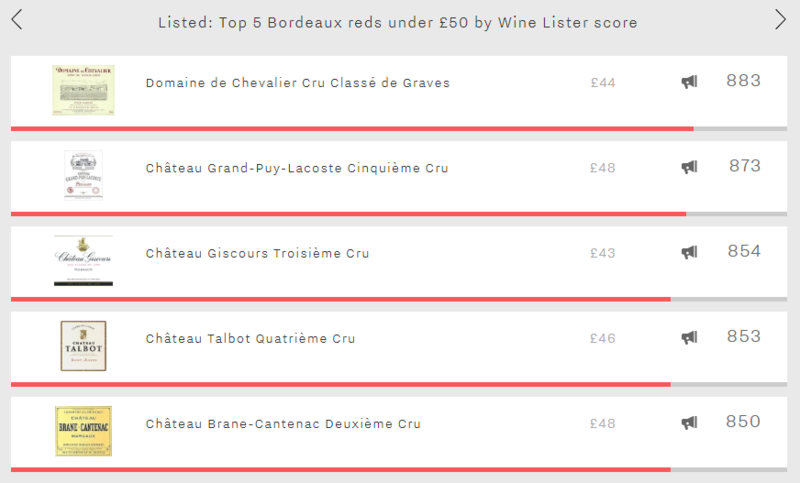 Since claret is a frequent feature at the Christmas table, this week we consider the best red Bordeaux under £50 by Wine Lister score (although note that prices are based on the per bottle average of in-bond case prices across vintages). Each of this week’s top five are Buzz Brands, with every wine earning its best score in the Brand category. They also all hail from the left bank, and achieve an average Wine Lister score of 863, 75 points higher than the right bank’s top reds under £50 (788). First of this week’s top five both overall and for Quality is Domaine de Chevalier, with scores of 883 and 885 respectively, and an average price of £44 per bottle. Though its most qualitative vintage (2015) is only just physical, and therefore not suitable for drinking straight away, there are plenty of vintages around the same in-bond per-case price point to choose from. For example, the 2011 holds a Quality score of 864 and a price of £36, and the 2008 a Quality score of 855 for £40. Next on the list is Grand-Puy-Lacoste, with a Wine Lister score of 873, and coming in at £48 on average. The 2014 Grand-Puy-Lacoste provides by far the best Quality to price ratio of recent vintages, with a Quality score of 946 and an in-bond per-case price of £41 per bottle. Wine Lister partner critic Neal Martin awards it 95 points, and notes, “the purity and elegance of this Pauillac cannot be denied – a quite brilliant contribution to the 2014 vintage”. This is a wine to give to a loved one for Christmas for them to stow away and open several years down the line – its drinking window ranging from 2022 to 2040. 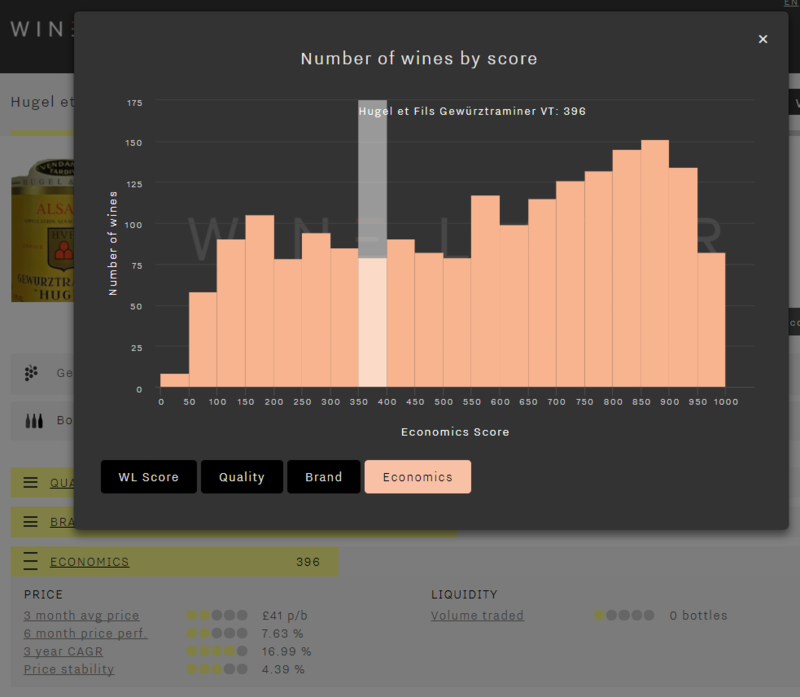 To view quality to price ratios for every wine on Wine Lister, on each wine page use the Value Pick score on Vintage Value Identifier charts, as above. Wines three, four, and five of this week’s Listed blog stand within a mere four points of each other. The two Margaux wines to feature, Giscours and Brane-Cantenac, achieve Wine Lister scores of 854 and 850 respectively, and have an identical Quality score (804). 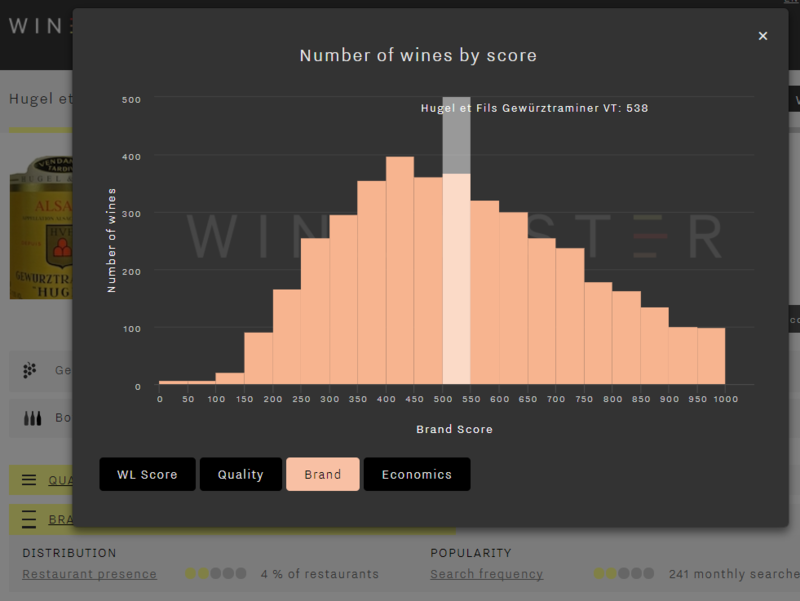 However, their profiles differ elsewhere, Brane-Cantenac being the better performer for Economics (806 vs 791), whereas Giscours excels for Brand strength (956 vs 934). Sandwiched between the two in this week’s top five line-up is Talbot, which claims the group’s highest Brand score (984), if also the lowest Quality score (748), and an average price of £46. A final commonality of all five wines (and of course of top Bordeaux red as a whole) is the long ageing potential. These five left bank reds have an average drinking window of 13 years, with some more recent vintages expected to be drinking well until beyond 2040 – testament to the tradition of buying claret to lay down for life, and not just for Christmas. If ever there was a time of year to push the boat out, then surely this is it. So this week our Listed section travels to Burgundy for Chambertin’s top five wines for Quality. All achieving a Quality score of at least 966, thus ranking amongst the very best on Wine Lister’s database, these are some of the most sought-after wines in the world. Leading the way with a score of 991 is Leroy’s offering. This exceptional score is the third-best Quality score on Wine Lister and the highest of any red wine (alongside DRC La Romanée-Conti). Across all vintages, it receives near-perfect ratings from Wine Lister partner critics Jancis Robinson and Jeannie Cho Lee (19.5/20 and 99/100 respectively). Moreover, Jeannie Cho Lee awarded a 100 point score to the 2015 vintage. But with the longest ageing potential of the group – over 18 years on average – the 2015 will reward patient drinkers, and with a wine-level average price of £2982 per bottle, you would want to savour it at its peak. Next come Dujac and Rousseau’s offerings with scores of 976. Whilst these wines achieve identical Quality scores, and similar Economics ratings (951 and 979 respectively), the Rousseau achieves a far superior Brand score (960 vs 608). 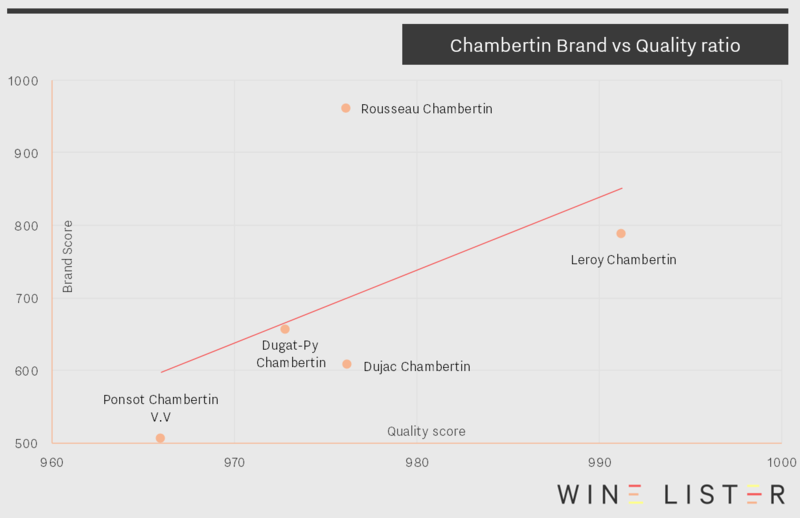 In fact Rousseau’s Chambertin convincingly outperforms the others in the Brand category, which achieve an average score of 638. 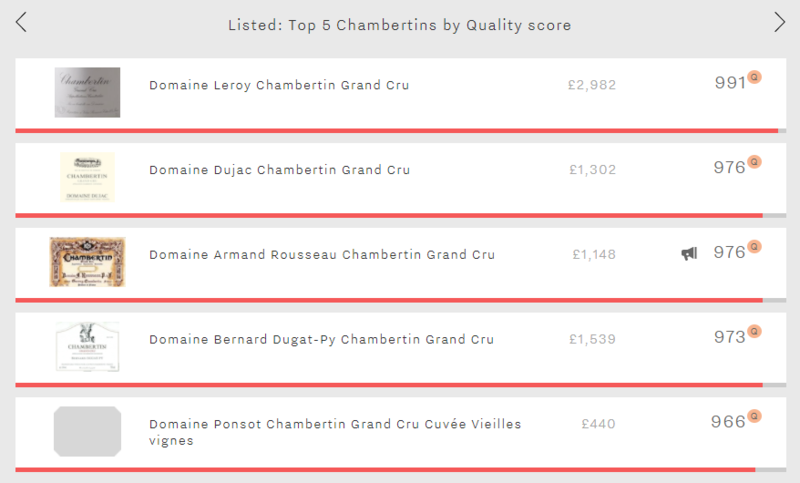 The chart below confirms that Rousseau’s Chambertin enjoys far greater brand recognition than its Quality score would suggest within this set of peers, definitely earning its Buzz Brand status. In fourth place is Dugat-Py’s Chambertin (973), just seven points ahead of Ponsot’s Chambertin Cuvée Vieilles Vignes (966). Despite their similar Quality scores, there is a noticeable difference in their prices, with the Dugat-Py the second most expensive wine in the group (£1539), whilst the Ponsot is by far the cheapest (£440) and looks relatively good value. If we look a little further, Ponsot Chambertin 2007, with a Quality score of 968 is currently available for as little as £399 per bottle and is in the middle of its drinking window, making it an excellent proposition for that seasonal treat. If you are interested in Burgundy and its position in the fine wine market, then watch this space for our forthcoming in-depth regional study, due to be released in January. Christmas is a time of tradition. Whether we like it or not, we tend to spend each year doing, eating, and drinking the same as we did the year before. Whilst everybody’s idea of Christmas will be personal, usually based on childhood memories, there are clearly a shared set of rituals that most of tend to follow: mince pies, turkey or goose, crackers, Christmas pudding. There are also certain styles of wine that we associate with Christmas (though these associations are probably not based on childhood memories!). We decided to look a bit further into the online popularity of specific regions and styles of wine to determine whether in fact we do all drink the same things over the festive season. Comparing the search frequency of each region’s 25 most popular wines on Wine-Searcher during December 2016 compared to the average of the previous three months, the results are conclusive. Champagne and Port both enjoyed a dramatic surge in popularity – receiving over a quarter more searches during December. Whilst Port’s dramatic increase in online search frequency was presumably because it is the classic accompaniment to another festive favourite – Stilton – Champagne’s seasonal rise in popularity must be because it is not just the tipple of choice at Christmas parties, but also at New Year’s celebrations. It seems that we also tend to favour the sweet whites of Sauternes and Barsac over Christmas, their 25 most popular wines enjoying a 16% increase in online search frequency. When it comes to dry reds, we appear to gravitate towards hearty styles at this time of year, with Tuscany and the Rhône also experiencing noticeable boosts in online popularity (up 15% and 14% respectively). 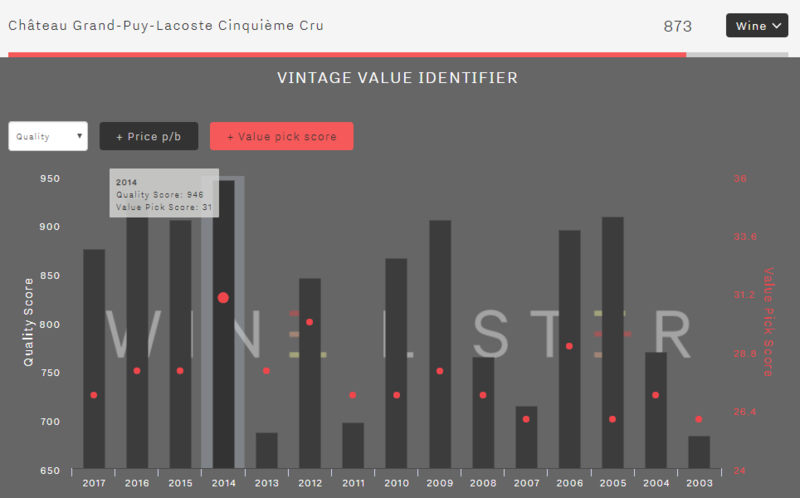 If you haven’t yet stocked up on those perennial favourites, Wine Lister’s Value Pick search tool can help you effortlessly find top Quality at a reasonable price. Each of our Christmas Value Picks achieves an outstanding Quality score of at least 965, putting them amongst the very best on Wine Lister. With the most expensive – Warre’s Vintage Port 2000 – available for as little as £47, they represent remarkable value. 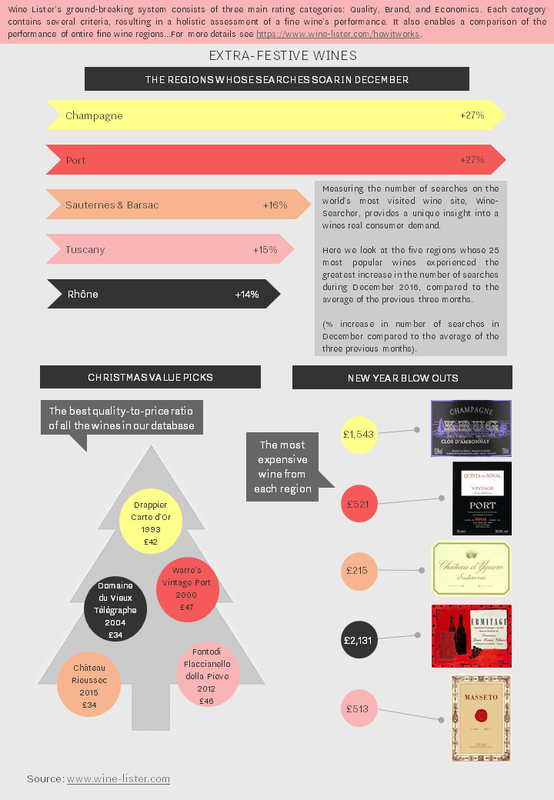 If you are after a really special bottle for New Year’s, then we also show the most expensive wine from each region. Each of these wines qualify as Wine Lister Buzz Brands, and is sure to help start 2018 with a bang. This week’s top five takes Wine Lister to the Douro Valley in search of its vintage ports. In some ways this top five is very much a four plus one, with the fifth placed Quinta do Noval Nacional, costing nine to ten times more than each of the others. It is also the only one to enjoy Buzz Brand status. At a total Wine Lister score of 880 and £521 per bottle, against the top-ranked Taylor’s 932 and £60, that constitutes quite a buzz. Here is a classic case of all metrics count but some count for more than others when it comes to cost. With a stonking 981 for Quality and the longest drinking window in its peer group the Quinto do Noval is clearly the nichest of the niche; its relatively low restaurant presence (9%) and monthly searches (2,457, on average, to Taylor’s 10,787) make its Wine Lister Brand score (825) well below Taylor’s and the other three. 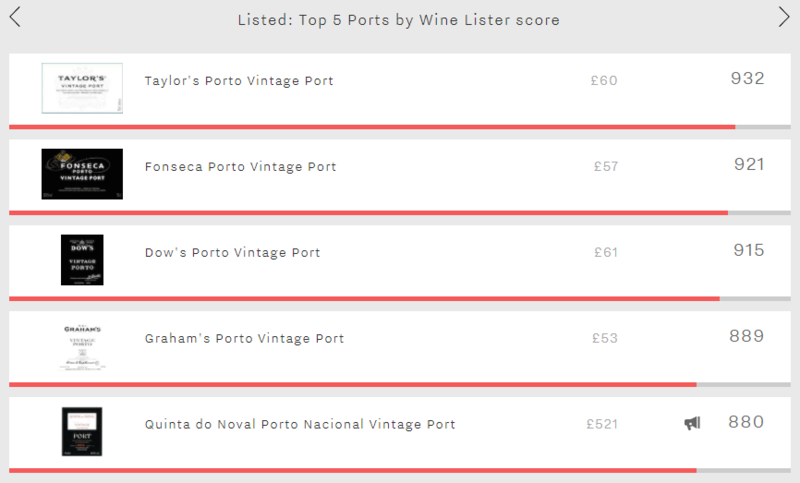 With an overall score of 932, an excellent Quality score of 967, and a Brand score of 965 based on decent restaurant presence (23%) and over 10,700 average monthly searches, Taylor’s tops the Vintage ports. Fonseca comes a close second at an overall 921. With almost identical Quality (965) and slightly lower Brand (942), Fonseca just pips Taylor’s for liquidity, with 1,072 (against 1,061) of its top five vintages traded at auction in the past year. At around £60 per bottle on average, Taylor’s and Fonseca are each affordable flutters with future Christmases in mind. Even illustrious older vintages such as 1970 and 1977 – in their drinking prime this Christmas – can be found at two to three times the price. The same goes for third-placed Dow’s (£61) and fourth-placed Graham’s (£53). At an overall 915 Dow’s has a slightly lower Quality score than the top two. 943 is nevertheless still highly creditable. Graham’s edges Dow’s on Quality at 948 but a relatively lowly 650 for Economics brings it down to 889 overall. All in all, Taylor’s and Fonseca merit their top two spots. If Santa has very deep pockets then consider adding Quinto do Noval 1994 to your wishlist (at a cool £1,229).